I have read the comics. I have seen the movies. I have owned the toys. There are a lot of great stories about fictional characters with special powers. As a child I wanted them to be real, but how could it be true? My parents told me that superheroes only existed in comic books and weekend cartoons. All my life I was a non-believer. I am writing this to tell you that on Saturday, with my own eyes, I saw people with superpowers and it has forever changed me. I have been blessed to own Price Busters Games for 12 years now and have gotten to meet a lot of great people in my time doing this wonderful job. About 3 months ago I got to meet a special young man. His name is Mason and he loves comic books. I did not realize at the time Mason was going through something no one deserves to go through: Mason, 15, has been diagnosed with Cystinosis. This disease slowly destroys the organs, and Mason is currently awaiting a kidney transplant. With all Mason is going through, he has such a positive attitude about life and I admire that about him. Over the last several months, it has been my honor to have Mason as a customer. My employees and I have wanted to do something special for him. With Batman Day coming up, we decided to have a fundraiser to help him with his expenses. Around the first of the month, I contacted Katherine Bishop with Kinematic Entertainment and asked for the help with the fundraiser. I told Kat that we wanted to do something special for Mason on Batman Day, as Mason is a huge Batman fan. We wanted to find a Batman to come to the store and take pictures with him. I also told Kat that one of Mason's other favorite characters is Deadpool and that Alex wanted to surprise Mason with a Deadpool appearance. Kat was able to contact the great people from Broken Skulls Productions who said they would help line up Batman. Not only were they able to find Batman, but they also found us Harley Quinn, Joker, Catwoman, Rorschach, and Deadpool. Saturday morning came, and we were putting up decorations around the shop. 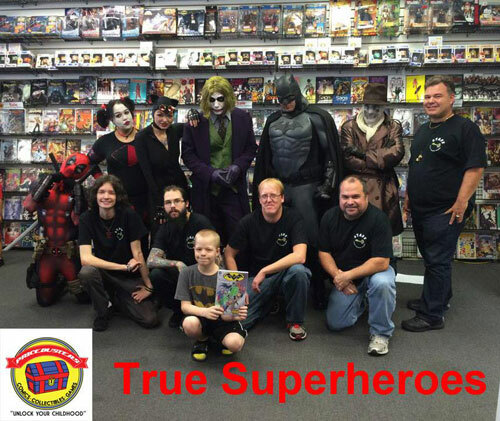 We had told customers that Batman and his friends where going to be at the shop from 12:30 to 3:30. Kat showed up around noon, and I asked her where Batman and Rorschach were; she said that they were on their way from Jackson, Mississippi and would arrive shortly. I did not realize they were coming from that far away. Deadpool was the first to arrive; Alex told him that Cecily, Mason's mother, was going to bring him to the shop at 1:00 and wanted to surprise Mason with Deadpool appearance. Deadpool agreed to wait in the back of the store to surprise him. Around 1:00, Mason came walking into the store and was greeted by Batman, Harley Quinn, Joker, Catwoman and Rorschach. We told Mason that we wanted to take a picture of him and his new friends. We lined everyone up in front of the showcases in the back of the store. As we were getting ready to take the picture, Deadpool, in stealth mode, came around the showcases and photobombed the group. Mason turned around and was surprised to see yet another one of his favorite characters. The smile on his face was priceless; a child's smile is one of life's greatest blessings. This is the moment that made me believe. Superheroes really do exist. Anyone who will volunteer their personal time to bring a smile to the face of a child who is going through so much is a superhero with superpowers in my book. Benjamin Parker said, "With great power comes great responsibility," and these superheroes used their powers well. It was an honor to meet each and everyone of them. There is a special place in heaven for these superheroes. Believe me on this. I have read the comics. I have seen the movies. I have owned the toys. And I now know superheroes truly do exist. My mind has been changed forever.